Fairy Houses All Year celebrates the year-round pleasures of fairy house building. Through the use of seasonal varieties, kids and families can engage in this natural and creative endeavor through all seasons. Activities and materials found in each season are highlighted throughout the book. For example, fall fairy houses feature vibrant colored leaves, pumpkins, and late blooming flowers. Winter fairy houses are built using snow, ice, old birds’ nests, or the dried husks of milkweed and seed pods. In spring, fairy houses become abundant with early blooms, bare branches, and lots of mud! Summer fairy houses are perhaps the most decorative because choices for the summer fairy house are boundless. 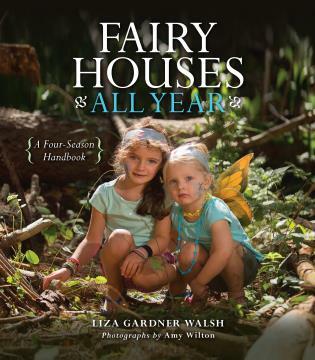 Filled with color photos, snippets of fairy lore, helpful advice and instructions, and lots of information about nature, Fairy Houses All Year is the ideal handbook for crafting fairy homes no matter the season. Liza Gardner Walsh has worked as a pre-school teacher, children’s librarian, high-school English teacher, writing tutor, museum educator, and she holds an MFA in writing from Vermont College. She lives with her family in Camden, Maine.